Today’s Pro Interview features Sheldon, a project planning tool that focuses on team management and utilization. It is designed for digital agencies, marketing agencies and management consulting agencies. Thanks to their PR person Amy Chamberlain, we had the opportunity to connect with the Sheldon team from Flick Software. Sheldon – We’re a young team of millennials comprised of ten people based in Ottawa’s tech sector. We’re a productive team that also likes to have fun by indulging in pizza and nerf guns. Underneath it all, we’re just a bunch of nerds sharing our take on project-based services. Pagezii – How did you get the idea of building it? Sheldon – The idea sprouted from our internal need for a project planning tool. We needed something to help us manage who was working on what project at what time. That expanded to understanding how long a project was being worked on, in relation to how much revenue it was generating. Keeping spreadsheets up to date was becoming more of a hassle than they were worth. They were also error prone and hard to fix. So it was a team effort to develop each part of Sheldon so that we could fix specific problems that were inhibiting our growth. Pagezii – What’s the story behind the name Sheldon? Sheldon – We came up with the name Sheldon by pulling personalities from two different places. We took the “nerdiness” of Sheldon from The Big Bang Theory and the “expertise” of Sheldon mentioned in When Harry Met Sally to develop a personality for our Sheldon. We wanted Sheldon’s image to be more fun and less corporate. We couldn’t develop a product called, “Project Management Pro”. It wouldn’t be us. Pagezii – What market and vertical does Sheldon target? Sheldon – We’re starting out by focusing on Startups and SMBs in three main verticals: digital agencies, marketing agencies, and management consulting agencies. Agencies looking for accurate metrics so that people working at the business level can make confident decisions. Pagezii – What’s on the roadmap? Sheldon – Our main focus right now is setting up integrations of existing workflow tools into Sheldon. We don’t want Sheldon to be an island, we want him to coordinate with everything! Eventually, Sheldon will provide analytics around how to build the optimal team for the project. He’ll also be able to provide project predictions so that users can make confident decisions about their project planning. We also hope to integrate “What if…” analysis into the tool. You will be able to ask Sheldon a question pertaining to your project plans and get solid answers. Currently, a portion of Sheldon is mobile-friendly. You don’t have full access to every feature on mobile just yet but there are mobile specific functions already available. There’s no plan to have an app made just yet, but you never know what might happen in the future. Right now we are offering Sheldon for free with no limitations for a limited time only to anyone who wishes to try him out. We do have a pricing model on our website right now to show what’s to be expected in the future. Pagezii – What makes it unique? 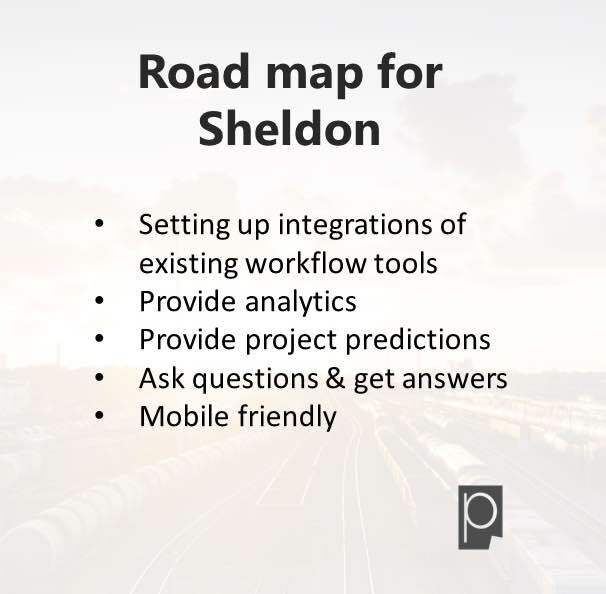 Sheldon – Sheldon is unique because, from an operational point of view, the tool offers project forecasting and can help you plan out your resources and how you are going to use them. The tool makes calculations that spreadsheets simply can’t do with ease and simplicity. From a marketing point of view, even though Sheldon isn’t real, we’ve created him with his own personality through a conversational tone to make the tool fun and not stuffy. We’re marketing Sheldon as if the tool is a person instead of a product. We want him to seem human and attractive to other young and small businesses. Business should be fun! Pagezii – Thank you, for a detailed walk through on who and what is Sheldon. If anyone is in the market for a project planning tool, then they should give Sheldon a try at www.getsheldon.com.